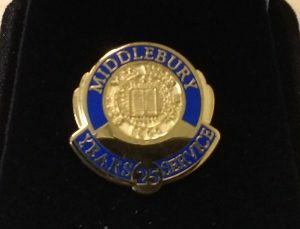 In this post we recognize Vickie Backus, Associate Laboratory Professor in Biology, for her 25 years of Service to Middlebury. Vickie mentions her favorite spot on campus, reveals some of her interests and hobbies, and shares some advice to new employees. Read on to learn more about Midd from Vickie’s point of view. I was a Post Doctoral Fellow at the University of Houston. Prior to that I was a Ph.D. student at the University of Vermont and actually taught a one semester course BIOL0190 Ecology in the fall of 2011 as a visiting professor. Assistant in Science Teaching, Associate in Science teaching, Visiting Professor, Associate Laboratory Professor. Associate in Laboratory Professor is my current job title. I got married to Wesley Wright. Still married to Wesley Wright. Our son William is 18 and a senior at Mt. Abraham Union Middle and High School. I am a member of the Invertebrate Scientific Advisory Group for the State of Vermont. We advise the Endangered Species Committee for the State of Vermont on applications for listing to the Endangered Species List. The students that I’ve help over the years. I love hearing from them and finding out what they are doing. This is a really interesting career. Science is always changing, the way teachers work changes and the students have changed quite a bit. It is a different thing every day and I get to learn something new every day. Keep working for several more years, then travel. The roof of Bicentennial Hall. The view is spectacular. So many but to list two: George Saul and Tom Root–they were/are both amazing teachers and taught me a lot. Take advantage of the opportunities here. 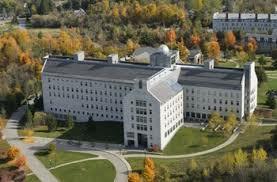 It is an amazing place and there is so much you can do.